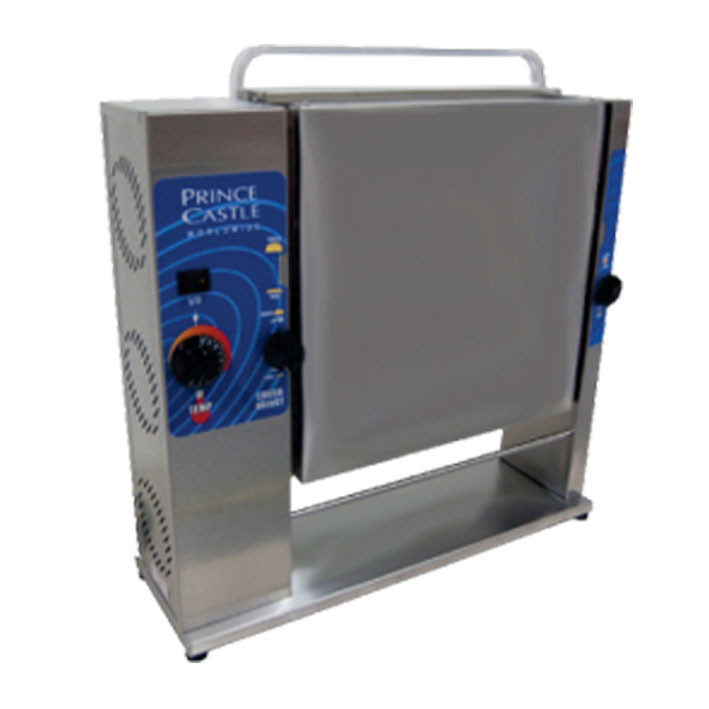 Prince Castle's Slim-Line Bun Toaster provides perfect carmelization by contact toasting. The 297-Series toasters put versatility in your kitchen and use less counter space. A unique two-level platen design allows operators to toast thicker bun crowns and thinner bun heels at the same time. A self-adjusting chain assembly provides proper tensioning and helps prevent binding. Model 297-T9 toasts up to 2200 buns per hour, Model 297-T12P toasts up to 2000 buns per hour, Model 297-T20 toasts up to 1400 buns per hour, and Model 297-T40 toasts up to 720 buns per hour. Stainless-steel construction makes the 297-Series toaster durable and easy-to-clean. All Prince Castle Slim-Line Toasters include a Teflon sheet kit consisting of a stainless-steel clamp and two Teflon sheets to protect against bun sticking. These sheets are used one at a time over the platen to protect the toasting surface, to eliminate bun sticking and to keep the toaster clean and working properly.